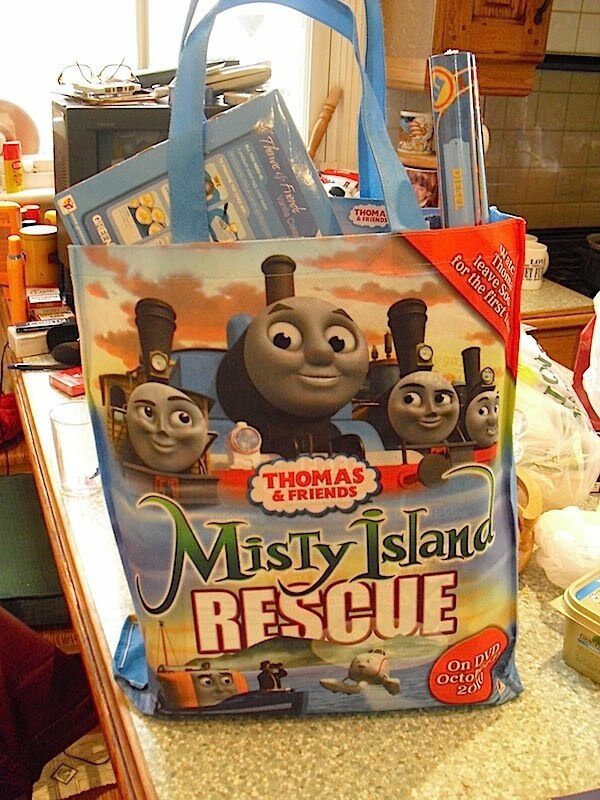 THE BRITISH RAILWAY STORIES LTD: "Misty Island Rescue - A Review"
I do like to keep tabs on the children's television series I playfully describe as "the opposition" - insomuch that Thomas & Friends is of course, the Manchester United, and my own, the Charlton Athletic, of the television world. Different leagues, and worlds apart, and I like it that way! I was however delighted to be invited to the Leicester Square Premiere of Misty Island Rescue, a one hour special of Thomas & Friends, by my good friend Ryan Hagan, of the Sodor Island Forums & Fansite. Not only that, but the group - which included Sean O'Connor of Sodor Island 3D, and Steve McG, creator of Tales From The Other Railway (a hilarious and satirical audio production that I am most fond of). Here's my review of the film, in full, with unbridled thoughts and the events which happened thereafter. Bear in mind I'm not the target audience for the film, but I hope my view can at least be taken at face value, as a budding children's author, film maker, and godfather to a Thomas-loving three year old. The film started out with what was actually a delightful animation of Thomas on Misty Island, pulling and shunting logging trains, with pieces of machinery whizzing and whirring all around. Hearing the music in the theatre didn't change my opinion on its similarities to Pirates of the Caribbean, but it did reinforce the view that the similarities were deliberate, in some respects. Like the Hero of the Rails introduction, it gave a flavour of that to come, and set the overall tone for the mystique of Misty Island. The actual 3D animation for the film was breathtaking. Greg Tiernan's company, Nitrogen, has done an incredible job animating the new characters of Captain, Bash & Dash, and Ferdinand. I was particularly impressed with the pipework on the steam locomotives, the overall rust and grime, and that the missing coupling rod was fixed in time for this film! Greg Tiernan was quick to point this out to us in the after party, and none of the SiF team which went to the premiere could fault the animation in the film - by far the best part of the film. Given the smaller budget, and time constraints of making these productions, the animation puts some other children's series to shame. Not naming any names, but other children's television series with bright and colourful graphics look distinctly plastic, and lifeless, by comparison. The rhyming of each and every sentence within the piece was extremely overplayed, and at times, maddening. The voice cast for the film seemed to do their best to work around it - and it was particularly noticeable how superior the British cast is to their American counterparts. Having seen and heard both versions of the film, I can confidently say that there was more sense of urgency, and more emotive force, in the voice actors in the UK's version. Keith Wickham was absolutely terrific in all of his roles, but excelled as the Fat Controller throughout. The only voices which were questionable were those chosen for Bash and Dash. I feel that their character models - being American - and the implied desire to make the "mainland" American in some sense - American accents would have been acceptable for these small locomotives. I felt the script was poorly developed from even its basic storyline. I question the logic in having Harold bring an injured climber to an unfinished search and rescue centre, and then having an engine take the climber away by train, for medical attention. It would have made more sense had Harold been seen to take the climber to the hospital first, in a cut scene, and then brought back to the rescue centre to be congratulated. 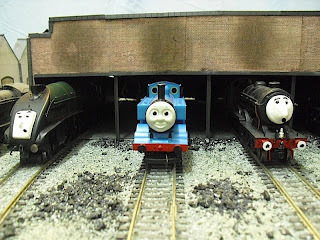 My biggest issue with the opening scenes of the film came in the portrayal of Diesel, against the background of Thomas. Now, the whole idea that "diesels are bad, steam engines are good" seems to undo the whole ethos the original railway series was based on - and the TV series continued - with its cast of characters. That is - the power source of the traction doesn't matter, they're all really useful engines after all. In human terms, you could say that they're "all equal" regardless of ethnicity, which is what I felt it suddenly seemed to boil down to. Thomas states to Diesel that he can't do the work - pulling the Jobi wood - because he's not a steam engine. While it's never said, the implication is that Diesel is inferior because he's a diesel engine. In a strange, and slightly perverse turn of events, we find it is Diesel having to prove to Thomas his worth as a steam engine, in stark contrast to that we've seen before, and undermining the really useful characters who ARE diesels - Mavis, Daisy, Boco and to a lesser extent, Derek - who have appeared before and are much loved characters. I don't think this as a premise is something that has been done in this way before. The "hero" of the piece - Thomas - is the one who inflames the situation by saying that Diesel is unable, or is less able, to do the work, because of his type of engine. Overplaying it I may well be, but it used to be the villain's job to insult and put down the hero, who ultimately takes a chance to prove his worth, and the villain, wrong. What we have here, is Thomas - the hero - acting as the part of the traditional villain, and then when Diesel tries to prove his worth - causing an accident in which the Jobi wood is lost and destroyed through Diesel running the train off an unfinished bridge. So not only does Thomas cause the situation to elevate rapidly, but, through chasing Diesel, he also causes the accident in which he then saves Diesel from falling off the cliff. That Diesel was trying to do that which, even in more recent episodes - is considered to be a positive thing to do - trying to prove one's worth through taking the initiative - and that this was then played as a negative role, while Thomas - who inflames the situation through putting Diesel down, and then gives chase and causes Diesel to have an accident - is portrayed in a positive light, is at its very core, wrong. If the characters had been reversed, and Diesel had been forced to save Thomas, and had apologized for the put downs, then there would be no problem, as the traditional villain - unintelligent, or otherwise, opinionated - would have been shown up to be a negative role model. Yet it is Thomas, the central character, who is the one that produces the negative message, and is later praised by the Fat Controller for it, with a reward of going to the mainland. This incident in particular worries me, as the whole concept of diesels against steam engines, and the almost glorifying of Thomas' role in this part of the film is morally wrong, and not something I'd be comfortable in letting my own godson see, without some form of way to explain that they're both equal really, and that the power source - diesel or coal - doesn't matter. But that's made impossible by this inexplicable role reversal, with the incorrect outcome for the event described. This is before I get onto the goofs contained all within this one action sequence. With the animation, railway realism and realistic environments are more possible than ever, but the way in which railway signals - which are designed as a system to make sure trains are separated into sections of track, and can only proceed into a section which is empty, ahead of them - are used as traffic lights in Thomas' chase of Diesel was absurd. Diesel, who when he started pushing the Jobi wood trucks, was not coupled to them, is then found to be coupled when the trucks start to fall, one by one, over the edge into the ravine below. Even more bewilderingly, Thomas, who has not been seen with a driver or a fireman, buffers up to Diesel - and is coupled to him by what is presumably one of his crew - without any sort of acknowledgment that this is what happens. The man appears, couples them together, and then is never seen again. The moral compass seemed distinctly off in this particular instance of the film, and it was not the first, nor was it the last time that I'd question the morals the film was producing. Onto the next set of scenes, and the bizarre way in which Thomas was to be shipped to the mainland. Given that there was shown to be enough space for Thomas and Spencer - who is lifted into the ship first as a non-speaking cameo role - the idea of the raft was invalidated by this particular sequence. Further - Thomas' position on the raft was inexcusably dangerous. Health and Safety is something that gets bandied around a lot these days, but it has its positive connotations and ramifications, and one of those is helping children to understand that you shouldn't indulge in dangerous activities. Thomas' position on the raft - in steam, not tied down to the raft in any way, and with a single chain coupling the raft to the ship, shows a distinct and alarmingly blasé attitude towards the character's safety. That the decision to put Thomas on the raft in this way, in the first place, in terms of the script - comes from Thomas himself - the most influential character in the franchise - is nothing short of horrific. Thomas puts himself in a dangerous position, and the ramifications - the consequences of doing that - should rightly have been pointed out to him by the Fat Controller as "wrong" when the film came to resolve its plot. This was never resolved, and thus any potential morals for safety are lost. Moreover, because it's not resolved, it appears - because Thomas has done it, and come out better - that it's then okay to do this. Which is a further unacceptable piece of plot development. I had a chuckle at the "docking" of Thomas' raft - conveniently finding the one dock on the Misty Island that had rails on it - and docking perfectly, allowing Thomas (who was sleeping) to roll onto it, and consequently the island, with no problems at all. The meeting of the three logging engines resulted in Thomas refusing an offer of help, and going off on his own to try and find a way off the island. If this was a case of "you don't speak to strangers"....then this part of the script would make sense, and I'd applaud it for the definite moral value, and life lesson, you could give to very young children. However, Thomas goes away, gets lost, is on his own and miserable, and promptly goes back to make amends with the logging engines. While all of this is going on, a fairly random scene in which Gordon is asked to help out in the search, with Whiff the Garbage Engine - "Oh the indignity!" - happens, and is never expanded upon again. A missed opportunity for, once again, showing that the express engine and the garbage engine are equal, and at that, equally useful engines. We return to the Thomas plot, and Thomas is helping the logging locos carry out their assumed roles - which make little sense in some respects. Banished to the island for being naughty - and collecting logs...for who and what exactly? They don't seem to have fully explained their roles at all. They're logging locos without a purpose - although the completely autonomous nature of the locomotive characters throughout the film is consistent in that vein. It was at this point that I finally clicked what has been missing from the HiT Entertainment episodes all these years. The engines have lost their assigned roles, and their purposes. Railways bring goods, and deliver goods, and take people to and from places of work and leisure. A locomotive without an assigned role, and a means of carrying it out, is just a machine that happens to run on rails, and not a railway locomotive, nor an interesting character. It's this which all the characters are missing, as they all seem to be there to drop their duties, and look for Thomas at a moment's notice. However, back to the Thomas sub-plot. I was rather hoping, as the logging site was shown further, and the logging engines given more to do - that we'd get better development of all three new engines, and their home. What we got, was another five instances of "that's right" from Ferdinand, and another three instances of "that's wrong" from me. The logging engines teased Thomas, liked watching the crane (hee-haw) throw logs and their trucks away - and generally like mucking around. That's not so bad if the actions are harmless, but, as you'll see, the ramifications of this script have further reaching consequences than that. The shake-shake bridge incident was the moment of the film that perhaps summed up my horror and frustration at that we'd been presented with. The bridge was incredibly animated - extremely well done by Nitrogen - but it was quite clearly dangerous to cross. The three logging locos crossed it, and Thomas refused. Stop it there - that's the right thing to do. The moral given here is simple. Don't get into a dangerous situation. Don't do something you don't want to do. I'd have given HiT Entertainment a medal if this had been the case, sincerely. What actually transpired was something very different, and very dangerous. Thomas is teased by the logging locos, and persuaded through some particularly and surprisingly strong peer pressure - to cross the shake shake bridge. He does so, and remarks "maybe I was wrong to say no". In all my time trying to write decent children's literature, I have never been rendered so speechless. I am absolutely positive, that, were I to produce this as part of a script for a TV series, or as part of the plot for a book, this sort of event would ruin any chances for publication or filming. To put it simply - it's wrong, and undoes a huge amount of work in some respects that the Thomas brand has built up, to this point. A major - and most certainly, the most influential - character, being coerced into doing something dangerous, then admitting that he was wrong for worrying - is a contradiction in terms that can be replicated by younger minds, who at this point would not perhaps understand that which was described to me by Sharon Miller at the after-party. Her description of the shake-shake bridge was something away from that Greg Tiernan's team had animated - to their credit, almost too well! - and was more in the style of a suspended bridge, shaking slightly in the movement of the locomotives which cross it. What she had written - and what Greg's team were instructed to animate - were almost complete opposites of each other. For the first time, I felt, while talking to them both, that I understand more fully how the show is developed, and how these sort of plot holes suddenly come to light. However - in the editing stage, this would have been a scene I would have had cut, instantly, its moral values completely wrong in every sense of the word. That this style of event would be replayed later - when Thomas leads the logging locos into the unsafe tunnel, and gets them trapped, only served to emphasize the problems with the script further. I honestly felt rather heartbroken at the end of the film. I didn't feel, over the course of sixty minutes, that the film was appropriate for children, given the actions it chose to not condone, and that which it chose to praise. The morals of the story were skewered, and lost beneath what could only be described as blatant merchandising attempts. That I actually have no real problem with - the series makes its money on selling merchandise, after all - but not at the cost of the series' credentials as the number one children's franchise. A franchise which, frankly, should know the difference between right and wrong, that discrimination of characters based on anything being "different" is wrong, that peer pressure, and being made to do dangerous things is wrong, and that the instrument at the heart of this - Thomas the Tank Engine - the character, is that which is making it seem okay to do all of the above - horrifies me. Overall the plot had significant and worrying problems, combined with a clear lack of editing at the writing level, and a significant and disturbing understanding of very basic moral values that children's television has been imparting to the young for generations now. I could not in all good conscience play this to my own godson without being there to explain away and try to reinforce the good morals of the piece - which were severely lacking, and most notably missing in all the most controversial parts of the film. Everyone else has given a score out of ten for the various portions of the film, but I do not feel able to separate all the divisions who worked on the film, as the fact remains that someone, somewhere, must have known that this film had problems from the word go, with regards its script. At a push, I would give the film 3 out of 10, all three points going to the third of the production that is Greg Tiernan's Nitrogen studios - who made the film look stunningly beautiful. The looks are insignificant, however, if the script is sub-standard. I felt that on this occasion, regardless of where any blame lies, or should lie - the script was terrible, and very, very lost, in its morality. I was extremely lucky to be invited by Ryan Hagan to attend this premiere, and the after-party afterwards, courtesy of HiT Entertainment. 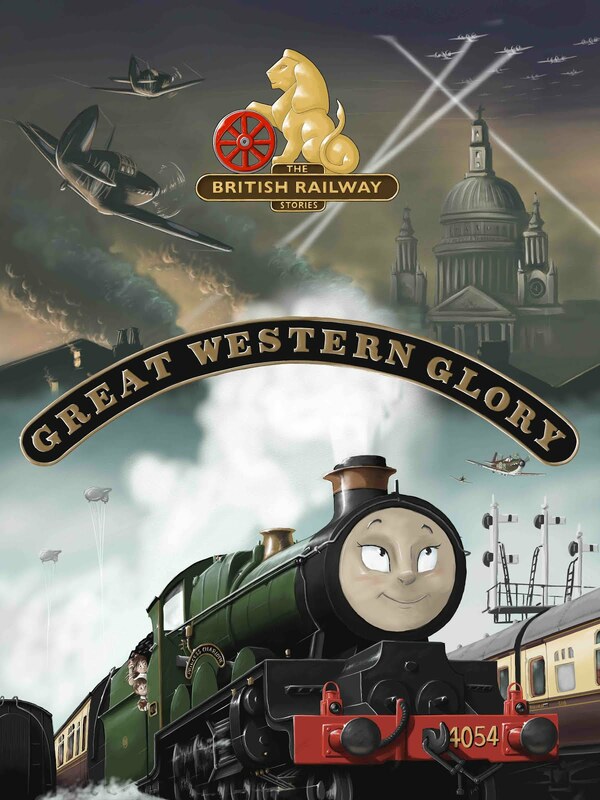 More than anything, I'd like to thank their staff for being incredibly courteous and welcoming throughout, and the goody bag - for which all bar the DVD is packed up, ready to give to my Thomas-loving godson - was a wonderful thing to be given, to take back with me. It was the people we met after the film, and spoke to, that really gave me a sense of hope back for the future. Most outspoken, and a proper diamond geezer at that, Greg Tiernan's railway knowledge and passion for the show turned my heartbreak into hope. The word "brakevan" was uttered by him first, and him alone, after I had spoken to his lovely wife on the very subject, when she went to broach him on it! Suffice to say, he assured us, they are on the case: the brakevans will be coming back. We talked on characters and their development - yes, there are new characters and old on their way. We will of course, remain silent on who they are, until such a time that the information is no longer deemed sensitive. I was gratified to be taken into such trust, and will not break it. All said, I feel that many fans will be delighted with the cast list that was intimated to us, over the next few seasons and specials. Greg is extremely passionate, and seems to push for a return to the roots of the program most strongly. That he carries around copies of The Island of Sodor and Reading Between the Lines, in his hand luggage, suggests his enthusiasm for the show and its heritage. I spoke briefly to Nicola Stinn, and I made a few suggestions that I think would go down with the Thomas fandom. My first suggestion was to drop the "Dr Suess the Tank Engine" rhyming (thank you Kurt), and both hers and Sharon Miller's reactions were very much in the positive response. Greg Tiernan's response was more direct, and determined - there was, I suspect, a bone of contention as to whether the rhyming was necessary, and Greg certainly shared my views on its inclusion. My second suggestion was rather simpler. It was for a character than I feel is one which the franchise has overlooked, despite making it as both a wooden railway, and an Etrl toy, many years ago. I suggested I'd be more than happy to photograph and measure up the locomotive in question, once she steams again next year, and is out on the mainline with her newer, much younger, apple green cousin, and the response from both Nicola and Greg was very much a positive "we'll look into it - and we'd be happy to look at anything you send us". Not only that, but Greg seemed intrigued by my suggestion to make the Mountain Engines TRS book into a full film, like Misty Island Rescue in length, but keeping its storylines intact, although developing the characters further for the purposes of the brand. Overall the fact that they were listening to us - what I'd call "interested parties" or to some extent, mature fans - and that they did so, and were very open and happy about receiving suggestions and offers of help for photography, for example - does them a great credit. This is not, incidentally, a call for fans to suddenly drop onto HiT with a shower of "I want I want" emails! Far from it. Greg's passion and determination to make the next series - and the next special - something better than this, and something closer to the heritage of the series, filled me with a renewed hope and confidence in certain portions of HiT Entertainment. I have been previously very negative, and am always happy to admit when I am wrong. The people behind Thomas do care - and they most definitely do care, if something goes wrong, and the reflection it gives on them all. Moreover, they care passionately enough to book weeks away in England, measuring up and studying locomotives and railways every year, trying to improve upon, and reinvent, certain portions of the brand, every time. Overall, the phrase comes to mind "it has to get worse before it gets better". After Hero of the Rails, I was hoping I was wrong, and that we were onto a winner. In terms of visuals, it was a great feast of beautiful forests, railway lines, tunnels and scenic locations. In terms of plot, the film failed on almost every level for me, and that was gut wrenching. But I went away from the premiere feeling a renewed confidence in the future of the brand, a better understanding of the development behind it, and an appreciation of the people behind the engine. They do care, and that counts for a lot in my book. Here's to the next series and film - and here's to Greg Tiernan, who was the one who I pin my hopes on for a renewed, and much improved, set of stories in times to come.